The importance of Alice Waters and Chez Panisse cannot be overstated. Miss Alice is arguably the root cause of our obsession with farm to table in American cuisine. 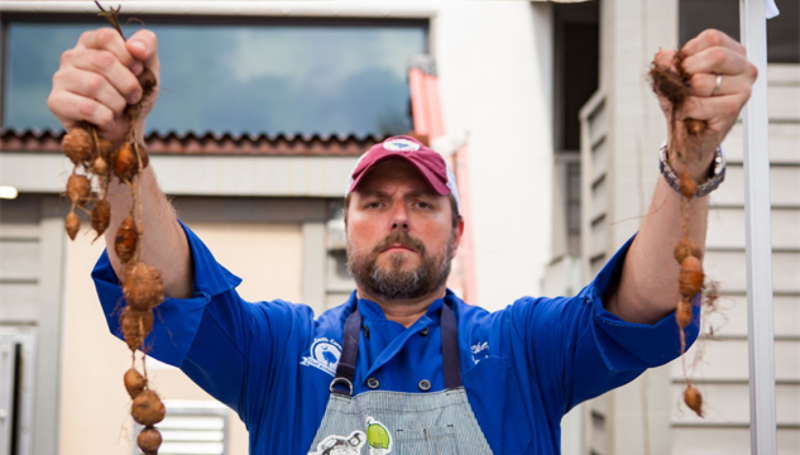 As a young culinarian in the 90’s, there were just a handful of farmers you’d get to know at the Charleston Farmer’s Market regularly- Joseph Fields, Celeste Albers, Dan Kennerty. How things have changed! While many or most of those farms are thankfully still with us, now we’re blessed to have our good friends at Growfood Carolina, our local grass roots food distribution hub, on our side. The farmers bring it to them, they bring it to us with real time updates as to what’s in season within 100 miles of South Carolina’s Lowcountry. And right now, that’s green garlic. Green garlic is the whole plant, harvested in the spring before the individual cloves have formed- its sweet umami is a game changer. Melt the butter in a 6 quart non-corroding pot. Add the garlic and 1/4 cup of the water. Bring to a simmer, cover tightly and cook for 15 minutes. Add the potatoes and remaining 1/2 cup water and simmer for 20 minutes. Add the chicken broth, cover the pot and allow to bubble gently for 20 minutes. Reheat the soup gently and serve it in warm bowls. Grind black pepper generously over each portion and serve with grilled slices of sourdough bread that have been brushed with melted butter and sprinkled with chopped fresh thyme or small croutons tossed in butter and baked until very crisp.